Senator John McCain, originally uploaded by johnwmacdonald. 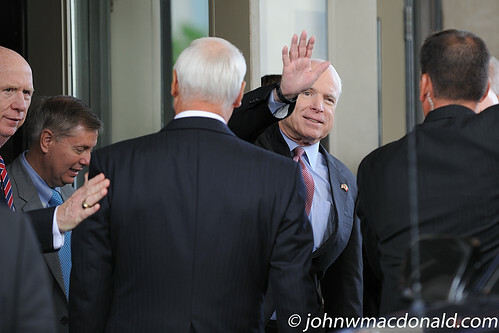 Senator John McCain, the Republican nominee for president of the United States, visits Ottawa Friday 20 June 2008 to deliver a free trade speech to the Economic Club of Canada. Far left is US Ambassador David H. Wilkins patting the back of Fairmont Château Laurier's general manager Claude J. Sauvé (back turned) as the Senator gives a brief wave to the crowd and then is whisked away by motorcade at the side entrance of the hotel. Tickets for the luncheon allegedly sold out within minutes when news of the event was posted on the club's website.